Our dedicated graphics card test system is with some of the fastest complementary components available to put any potential performance bottlenecks squarely on the GPU. Most of the hardware was provided by the manufacturers, but we purchased the cooler and storage ourselves. We’re comparing the Gigabyte RTX 2070 Windforce ($500 on Amazon) against the Nvidia GeForce RTX 2070 Founders Edition ($600 at Best Buy and GeForce.com) and EVGA RTX 2070 XC ($550 on Newegg). We’re also showing how it compares against the step-up GeForce RTX 2080 Founders Edition ($799 at Best Buy or GeForce.com) and last generation’s GeForce GTX 1070 Founders Edition, GeForce GTX 1080 Founders Edition, and PNY GeForce GTX 1080 Ti. 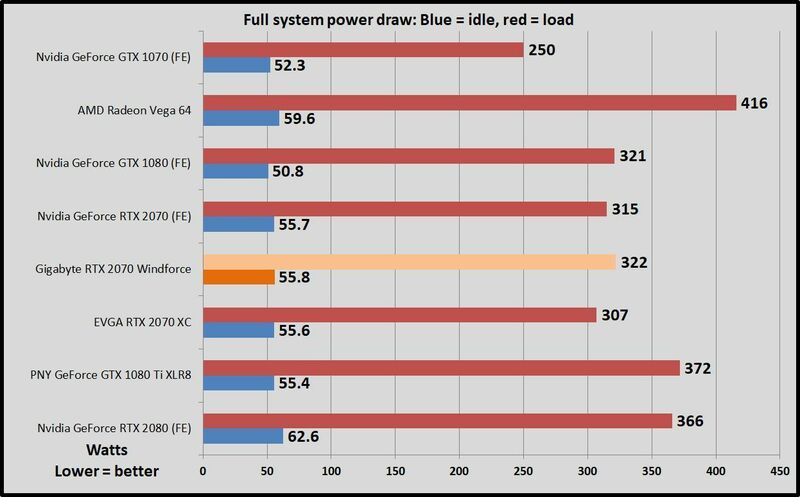 We’ve also included results from the Radeon RX Vega 64 reference card, AMD’s GTX 1080 rival. The RTX 2070’s performance is firmly established at this point, and while the Gigabyte Windforce version isn’t overclocked, it still hangs close to the Nvidia Founders Edition and EVGA RTX 2070 XC, even though they ship mildly faster from the factory. Because of that, we’ll be showing our gaming benchmarks without any additional meta-commentary until the conclusion of this piece. Middle-earth: Shadow of War ($50 on Humble) adds a strategic layer to the series’ sublime core gameplay loop, adapting the Nemesis system to let you create an army of personalized Orc commanders. It plays like a champ on PC, too, thanks to Monolith’s custom LithTech Firebird engine. We use the Ultra graphics preset but drop the Shadow Quality setting to High to avoid exceeding 8GB of VRAM usage. The latest in a long line of successful games, F1 2018 ($60 on Humble) is a benchmarking gem, supplying a wide array of both graphical and benchmarking options—making it a much more reliable measurement than the Forza series, which uses dynamic weather generation. It’s built on the fourth version of Codemasters’ buttery-smooth Ego game engine. We test two laps on the Australia course, with clear skies. 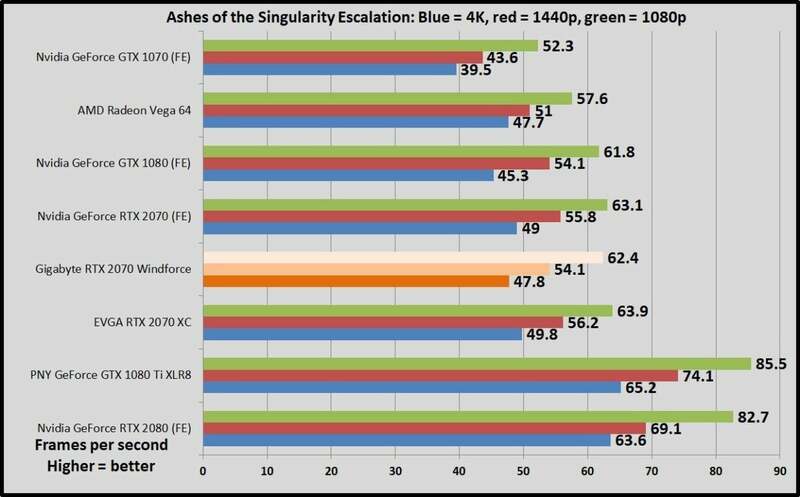 Ashes of the Singularity ($40 on Humble) was one of the very first DX12 games, and it remains a flag-bearer for the technology to this day thanks to the extreme scalability of Oxide Games’ next-gen Nitrous engine. With hundreds of units onscreen simultaneously and some serious graphics effects in play, the Crazy preset can make graphics cards sweat. Ashes runs in both DX11 and DX12, but we only test in DX12, as it delivers the best results for both Nvidia and AMD GPUs. 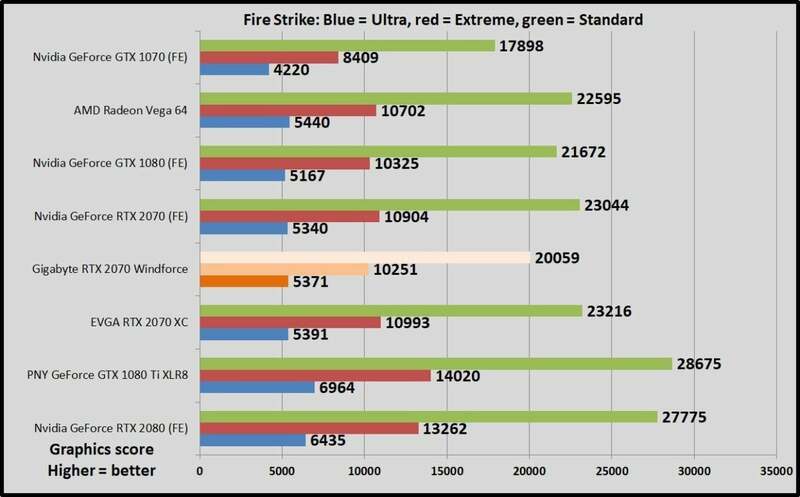 We also tested the Gigabyte RTX 2070 Windforce using 3DMark’s highly respected Fire Strike synthetic benchmark. Fire Strike runs at 1080p, Fire Strike Extreme runs at 1440p, and Fire Strike Ultra runs at 4K resolution. All render the same scene, but with more intense graphical effects as you move up the scale, so that Extreme and Ultra flavors stress GPUs even more. We record the graphics score to eliminate variance from the CPU. All three RTX 2070 options deliver broadly similar results. The Founders Edition lags slightly behind the Gigabyte Windforce in raw GPU score despite Nvidia’s mild factory overclock. Maybe its less-potent cooling solution isn’t able to hold clocks quite as high for quite as long? 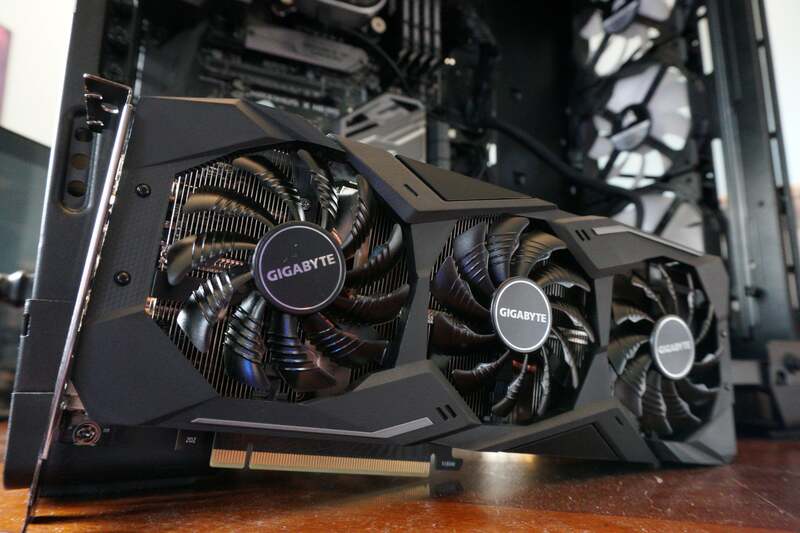 The Gigabyte RTX 2070 Windforce draws about the same amount of energy as its cousins. It actually draws slightly less power than the GTX 1080 despite being measurably faster, and much less power than AMD’s hot-and-howling Radeon RX Vega 64 reference edition. 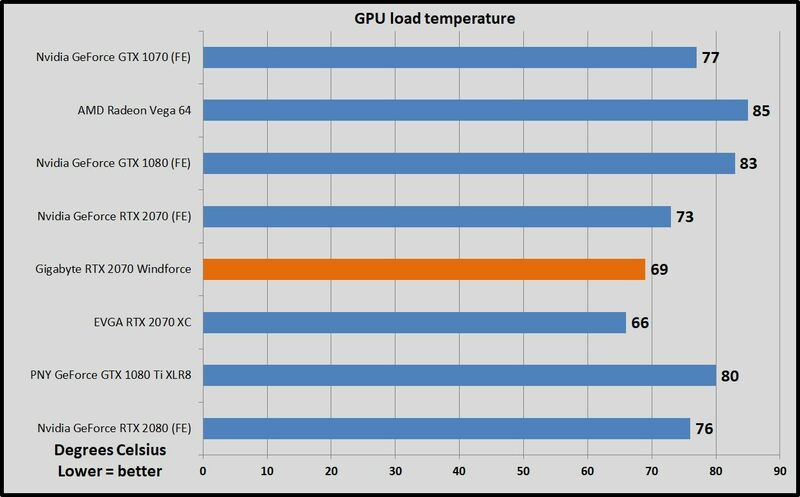 We test thermals by leaving EVGA’s Precision X1 monitoring tool open during the F1 2018 5-lap power draw test, noting the highest maximum temperature at the end. The custom, triple-fan Windforce cooler on Gigabyte’s card runs slightly colder than the Founders Edition’s dual-fan solution, though not quite as chilly as the ICX2 cooling in EVGA’s RTX 2070 XC. All three deliver similar noise levels—you definitely know the card is running while you’re gaming, but the sound isn’t obnoxious or overly loud. Gigabyte’s card holds an advantage when you’re not gaming, because the RTX 2070 Windforce lets the fans go idle when the GPU isn’t under load. 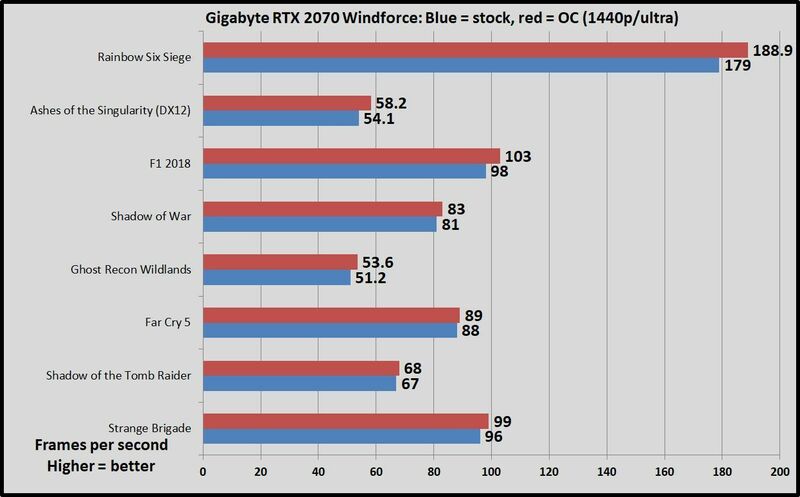 Next page: Overclocking, should you buy the Gigabyte RTX 2070 Windforce? 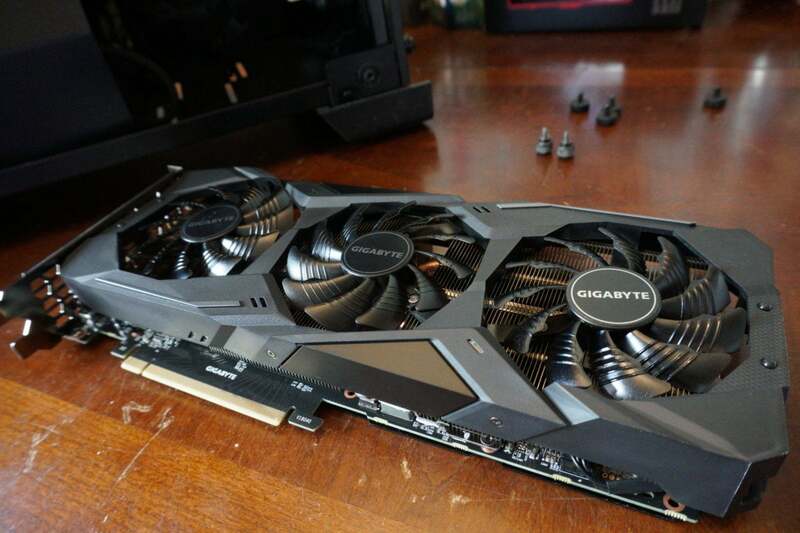 As with all RTX graphics card, overclocking the Gigabyte RTX 2070 is dead-simple thanks to the new one-click Nvidia Scanner API auto-overclocking tool. Despite hitting reference specs and an entry-level price tag, Gigabyte lets you increase the Windforce’s power limit—the major factor holding back RTX performance this generation—up to 114 percent, or roughly as much as you can with Nvidia’s Founders Edition. EVGA lets you crank the RTX 2070 XC up to a whopping 130 percent. 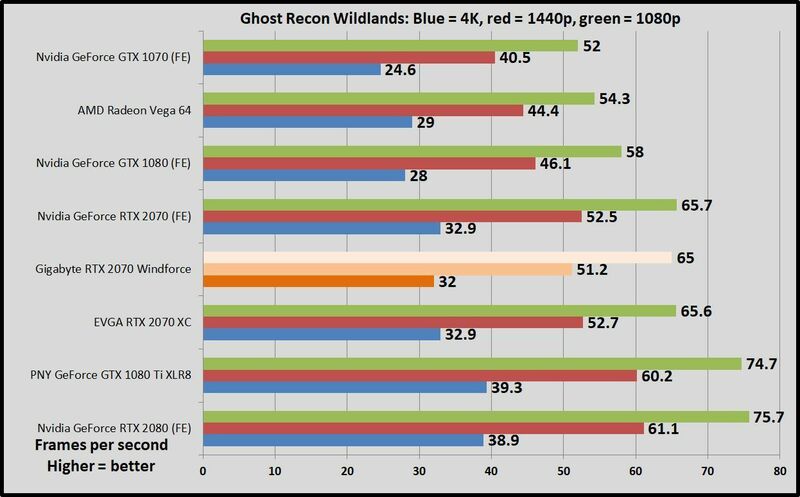 Once you’ve maxed out the power, GPU temperature, and voltage sliders and run the Scanner tool, however, we saw virtually identical overclocked performance out of all three of these RTX 2070 options. The Gigabyte Windforce’s +202 score resulted in a real-world boost clock of 1,753MHz, up from the 1,620MHz reference spec. 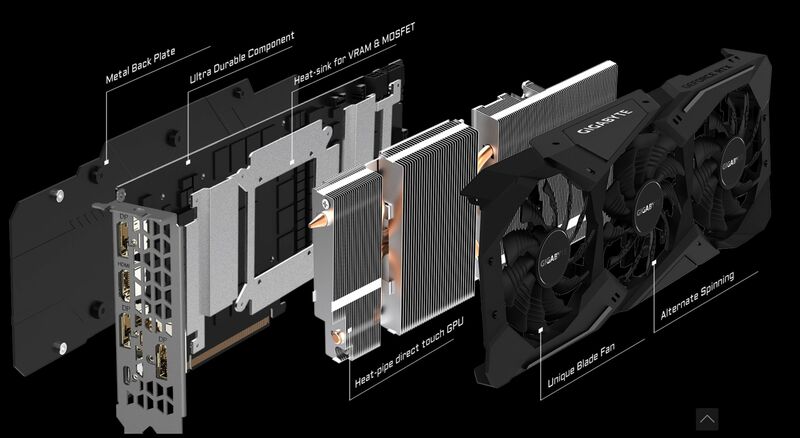 Nvidia’s GPU boost technology lets RTX graphics cards far exceed rated boost clocks, though. Fully loaded, all three hit sustained clock speeds around the 2GHz mark in most gaming workloads—going just over in lighter scenes, and dipping just under in heavier scenes. Definitely, if you’re in the market for a $500 graphics card. The RTX 2070 dominates its $500 rivals, the GTX 1080 and Radeon RX Vega 64, delivering a double-digit averaged performance advantage against the last-gen GPUs, and over 20 percent more performance in games that leverage async compute capabilities. Plus, Nvidia’s latest hardware grants access to the brave new worlds of ray tracing and AI-enhanced gaming. 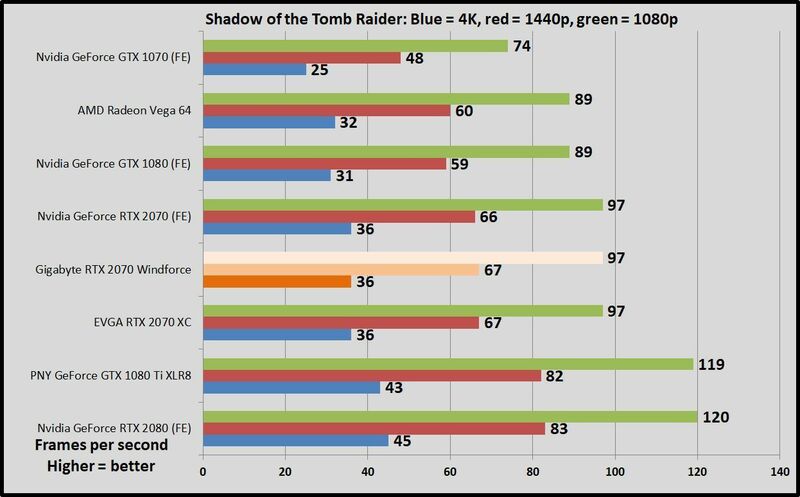 Because no real-world games incorporate those technologies yet, however, we can’t measure how well the cut-down RTX 2070 performs in those tasks compared to more expensive RTX options. 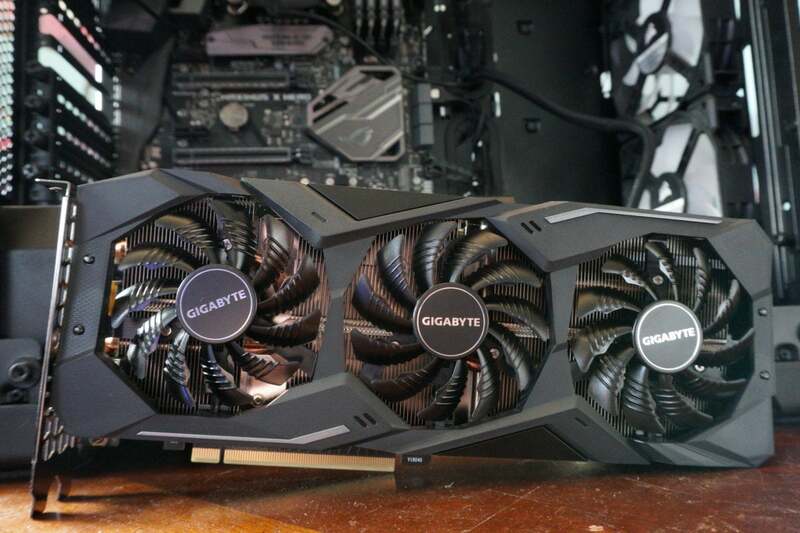 The Gigabyte RTX 2070 Windforce hangs with the overclocked $550 EVGA XC and $600 Nvidia Founders Edition performance-wise, despite sticking to stock speeds and a baseline price tag. Applying a quick and easy auto-overclock with Nvidia Scanner pushes the card’s frame rates beyond those pricier options—though those can also be overclocked—and the triple-fan Windforce cooler runs slightly colder than Founders Edition solution. Spending more would get you some nice extra features, like dual BIOSes and quieter cooling. 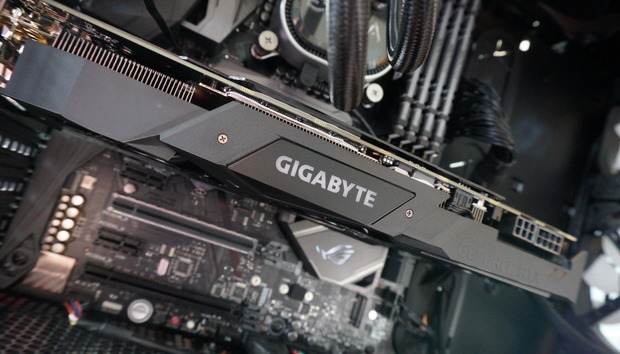 Nevertheless at $500 on Amazon, the Gigabyte RTX 2070 Windforce is easy to recommend. Pick it up if you’re looking for a great graphics card for high-refresh-rate 1440p gaming, or blazing-fast 1080p. It’s also capable of entry-level 4K gaming if you’re willing to turn some graphics options down to High. 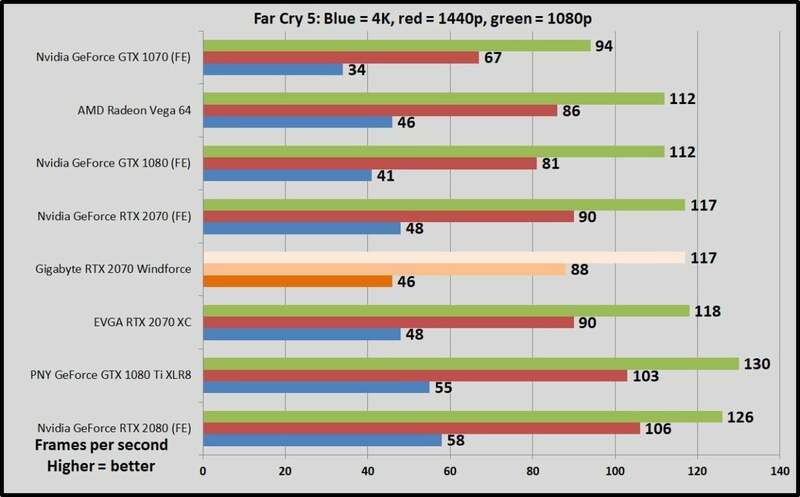 If you’re just looking for 1440p gaming at 60 frames per second, though, and especially if you don’t mind playing below Ultra graphics settings, you can save some scratch by opting for a last-gen GTX 1070 or GTX 1070 Ti instead. « Acer Predator Aethon 500 review: Seriously, who designed this keyboard?